Korea is an understated country. Maybe that is the reason why one of Asia’s most active research and development clusters nestled away in Daedeok Valley has not received the attention internationally of a Silicon Valley. Perhaps the researchers here are simply too busy doing their research in the Korean workaholic style to step back and think about how to publicize their abroad. Or perhaps Koreans still imagine themselves as lagging behind the more “advanced” nations of the world. But in this age wherein Samsung and Hyundai have become global players across multiple fields, and Korea’s leading edge in ship building, mobile communications and steel production draws attention, Daedeok Valley is also stepping into the spot light. When Korean President Park Jung-hee started construction on the science park back in 1974, he had a clear purpose: moving the research centers of Korea, then just starting on the road to high-tech stardom, down to Daedeok Valley in Daejeon far away from North Korea and the dangerous DMZ. But his advisors also had come to believe that the concentration of research institutes in this scenic region would create the mutual stimulation would benefit everyone. Since then the research community has expanded rapidly, with now close to 8,000 Ph.D.s in the sciences working in the valleys between the green hills of Daejeon. In fact many researchers have become so accustomed to the Daedeok environment that they have no particular desire to move. Most clusters in Asia are new and therefore their roots are rather shallow. Shenzhen or Malaysia’s research corridor simply lack the long term institutional maturity to conduct advanced research. Daedeok is quite a different story. Here we find considerable flexibility and innovation, but at the same time sufficient continuity to support a broad research and development effort. The Daedeok Innopolis ecosystem can be conceived of as six overlapping rings: universities (dominated by KAIST and Chungnam National University), research institutes, government and government-invested institutions, corporate research institutes and venture corporations. The mutual stimulation and cooperation between these six different communities produces remarkable innovation and commercialization of available technologies. When the Boston Consulting Group released recently a list of nations leading in innovation, Korea was ranked number two, just below Singapore. Daedeok Innopolis stands on the front line of Asian innovation, setting the pace for Asia and the world. Among Daedeok Innopolis’ universities KAIST (Korea Advanced Institute of Science and Technology) is considered the top technical university in Korea and one of a handful with global reach in East Asia. Strong fields at KAIST include computer science, electrical and nuclear engineering, mechanical design, chemistry and telecommunications. The national university Chungnam University also plays a central role in those fields, but brings also focused expertise in biotechnology, medicine and the agricultural sciences. These universities are complemented by such outstanding universities as Hanbat University (a leader in IT), Pai Chai University, Hannam University, Mokwon University and Woosong University. Research institutes in Daedeok include the Korea Research Institute of Bioscience and Biotechnology (KRIBB), the Korea Atomic Energy Research Institute (KAERI), Electronic and Telecommunications Research Institute (ETRI), the Korea Aerospace Research Institute (KARI), National Fusion Research Institute, National Nanofab Center, Korean Basic Science Research Institute, Korea Institute of Machinery and Materials, Korea Research Institute of Chemical Technology, Korea Institute of Science and Technology Information, Korea Research Institute of Standards and Science, Marine and Ocean Engineering Research Institute, Institute for information Technology Advancement, Korea Institute of Geosciences and Mineral Resources, Korea Institute of Energy Research, Agency for Defense Development, Korea Institute of Toxicology, Korea Institute of Oriental Medicine, Korea Institute of Nuclear Non-proliferation and Control, National Institute for Mathematical Sciences, Korea Institute of Nuclear Safety and the National Security Research Institute. Among the outstanding technology produced in Daedeok are ETRI’s wireless communications systems CDMA, WIBRO & DMB, KRIBB’s nano biochips, KARI’s KOMPSTAT satellites and NFRI’s KSTAR nuclear fusion reactor. Daedeok is also home to twenty-one corporate research centers with global reach surrounded by an equal number at smaller firms. Some of the notable corporate research centers are Dongbu Advanced Research Institute, (biotechnology, microorganisms and agrichemicals), GS-Caltex Value Creation Center (environmentally friendly products including substitutes for oil), Hanwha Chemical Research (biotechnology, electronics materials, catalysts & nanotechnology), Honam Petrochemical Daeduk Research Institute (synthetic chemistry & petrochemicals), LG Chemical LTD. Research Park (Lithium Ion Battery & Polymer Battery Development), Samyang R&D Center (medical Research and electronics) and SK Institute of Technology (petroleum-related research). Also such public corporation research institutes as Korea Electric Power Research Institute (hydroelectric projects and nuclear energy), Korea Institute of Construction Materials (authorized test agency for construction materials), Korea Institute of Aerospace Technology (aerospace design, satellites, launch technologies) are also part of the Daedeok ecosystem. The cross-fertilization between research fields in Daedeok encourages innovation and collaboration. Over the last 15 years, venture companies have sprung up like mushrooms after a spring rain, numbering over 800 at last count. Some of those companies have gone on to become major players and others are coming of age today. Daedeok is often referred to as the “Silicon Valley of Asia” but this analogy risks obscuring the full range of technologies available here. The engine driving Daedeok is the organic circulation of ideas about technology and business between policy makers, researchers and businessmen working in the fields of telecommunications, nanofabrication, biotechnology, water, nuclear and hydro power, nuclear fusion, design, measurement technologies, mechanical engineering, fuel cells, aeronautics, new materials, robotics, new drugs and environmental technologies. Daedeok is exceptionally well endowed in all these fields and is expanding its international ties rapidly. Daedeok Innopolis’ membership includes 898 corporations, 35 government invested and sponsored institutions; 6 universities; 15 public organizations. Daedeok Innopolis refers to the remarkable collection of R&D centers and venture companies that have congregated in the green hills of Daedeok Valley, north of the city of Daejeon in the Republic of Korea. The research institutes and the venture companies constitute one of Asia’s top innovation clusters for technology. Daedeok Innopolis derives its power it ability to effectively innovate, an organic and fluid ecosystem for creativity . The research institutes and universities in Daedeok Valley have spun off multiple start-ups and continue to do so at a remarkable pace. Unlike many other clusters one hears about, Korea has invested heavily in building up both the research expertise for over thirty years, creating long-term research programs of scale and depth. There are over seven thousand with Ph.Ds in the sciences in Daedeok and state-of-the-art infrastructure is in place that enables Daedeok to play a leading role in the world. That gives Daedeok the depth and the institutional continuity to conduct first-class research. Intekplus’s semiconductor package inspection systems, Hanool Robotics’s remarkable cleaning robots, Menix Corporation’s mobile security systems, RayCan’s next generation lasers and ABC NanoTech’s ceramic nano powder are just some of the products produced by the startlingly diverse panoply of venture companies that thrive in the ecosystem surrounding KAIST, Chungnam University, and the government and corporate research institutes. The city supports one of the fastest developing business communities with a strong emphasis on technological innovation. The recently opened Daedeok Techno Valley on the north side of town brings together research with light manufacturing to create a unique environment for R&D. The universities and research institutes have set up venture firms here to explore new applications of their technologies. More recently, Daejeon’s ACTS (Agency of Advanced Cultural Technologies and Services) has become a Mecca for multimedia entertainment and film. Daedeok Innopolis has a Business Hub Center to provide one-stob service for possible investors with special facilities for international firms and joint R&D, and plans a Technology Convergence Center and Foreign Investment Complex in the near future. I am not sure what to make of it, but today a friend informed me that a new book is listed on Amazon.com that includes me as its subject. It would be an honor to be included alongside Ahn Cheol-Soo of KAIST (soon to be at SNU AICT). I do not know Kim Jong-il. I assume it is a different person as the Kim Jong Il I am most familiar with is neither South Korean nor an educator. A devastating earthquake leveled the Chinese town of Wenchuan, leaving in its wake over 60,000 dead and five million homeless throughout Sichuan Province. It will take years to heal the damage of this tragedy. Nevertheless, even as aid organizations and local government scramble to erect temporary housing and supply drinking water, it’s important to step back and consider how the international community can properly contribute long after the last rescue crew has left. China can do Portugal one better. With international help, it can rebuild Wenchuan as an eco-city of energy efficiency and Green common sense that can inspire the world – a Gaviotas for the 21st century. Such an eco-city can be a model of sustainable development that points beyond the contradictions of economic growth based on energy consumption. Wenchuan could draw admirers just as Curitiba in Brazil does for its excellent public transportation and environmental urban planning. Such a tribute to the earthquake’s victims, by implementing solutions that can save the planet, would be more fitting than any plaque or monument. China has already shown itself to be open to the establishment of eco-cities. Dongtan island, near Shanghai, is an ambitious effort to create a next-generation low-energy-consumption community powered by sustainable energy and organized by the Shanghai Industrial Investment Corporation. Built by the global engineering firm ARUP, Dongtan will feature extensive local organic farming that will make it food self-sufficient. Its public transportation will be powered by hydrogen fuel cells, and its carbon footprint will be virtually nonexistent. By doing something similar inland, China can transform not only how it approaches the environment but, because of how important China is to the global picture, how the world deals with climate change. The recreation of Wengchuan as an eco-city could rely on an already extensive regional network of environmental cooperation. Korea signed environmental cooperation agreements with both China and Japan in 1993. The Sino-Japan Friendship Centre for Environmental Protection has been around for more than a decade. In particular, Japan has been working with China to control the latter’s air pollution. Japanese cities, too, have established sister city relations with their Chinese counterparts, which has served as a conduit for transferring technology and know-how. When Chinese premier Wen Jiabao visited Japan in early May, his tour of a state-of-the-art recycling plant prompted a request for cutting-edge Japanese technology to address China’s environmental problems. Wenchuan could raise regional cooperation to the next level. Japanese technology, Korean funding, and the support of the Chinese diaspora in Southeast Asia could all play important roles. Taiwan, too, could earmark special funds as part of a newly unfolding economic relationship with the mainland. But Wenchuan should not simply be a showcase. It must be sustainable and replicable. Much as Habitat for Humanity builds affordable housing for the poor around the world, the Wenchuan model must be workable not only where there are blank slates but also in existing cities. To deal effectively and honestly with the challenges of pollution, climate change, and energy inefficiency, we must focus our efforts on the neglected regions of the world where the struggle for economic growth trumps all other concerns. Using hybrid automobiles in wealthy countries or installing more efficient refrigerators, while necessary, is not nearly enough. Funding from wealthy countries must help cities like Wenchuan meet the new global standards for reducing carbon emissions. In the spirit of the new age of environmentalism, let us update Kennedy’s famous words. Let us say today “Wo shi Wenchuan de Shimin” (I am a citizen of Wenchuan). In that spirit of compassion, let us rebuild Wenchuan, the victim of an act of nature, with an eye toward rebuilding all of our cities, the victims of our blind embrace of unsustainable growth. I published this article in the Kyung Hee University Weekley Newspaper (경희주보) last week. The article stresses the degree to which people around the world benchmark Korea today while calling on young Koreans to set a higher standard for everyone through their actions. 한국 학생은 자신의 행동이 개인적인 행동에 지나지 않는다고 여긴다. 그러나 한국 학생의 행동 하나하나는 전 세계에 큰 여파를 미칠 수도 있다. 때문에 더 이상 자신들의 욕구 충족과 즐거움만을 추구해서는 안 된다. 이제는 한국 학생 하나하나가 전 세계에서 한국을 대표하는 외교관이 돼야한다. 한국의 문화는 현재 세계에서 거대한 영향력을 가지고 있다. 특히 많은 개발도상국이 한국의 다양한 면을 본받으려고 하고 있다. 동남아시아, 중앙아시아, 중동, 아프리카 등이 이른바 선진국이라고 불리는 미국이나 유럽이 아닌, 한국의 장점을 배우려 노력하고 있다. 한국의 정책, 기술 특히 한국의 문화에 관심을 보이고 있다. 예를 들어 동남아시아나 중앙아시아의 청소년들은 한국 영화나 드라마를 보고 드라마 속에 비친 한국의 생활상을 모방하려고 한다. 개발도상국에게 미국이나 유럽은 문화도 다르고 이미 예전부터 발전한 선진국으로 비춰지기 때문에 다가가기 어렵게 느껴진다. 그러나 한국은 개발도상국에서 선진국 반열에 오른지 얼마되지 않아 다가가기 쉽고 한국의 문화도 이들에게 서양보다 훨씬 흥미롭게 다가온다. 또한 한국인을 환경 문제에 관심이 많고 지적이며 주변 사람들을 존중할 줄 아는 사람이라고 생각한다. 이렇게 한국에 대해 좋은 인식을 가지고 있기 때문에 많은 나라들이 한국인의 모습을 본받으려 한다. 그러나 한국인들이 이런 인식과 달리 자기중심적인 생활, 환경을 고려하지 않은 사치스러운 소비를 한다면 한국을 동경하는 많은 나라의 청소년들이 이에 영향을 받을 것이다. 이처럼 한국인의 행동 하나하나는 자신뿐만 아니라 전 세계적으로도 영향을 미칠 수 있다. 게다가 앞으로는 한국인의 영향력이 더욱 커질 것이다. 때문에 개인의 작은 행동도 지구적 차원에서는 큰 의미를 지니며 개인의 사소한 생활방식이나 행동에도 큰 책임이 따른다. 한국에서 학생을 지도하는 나 자신도 책임의식을 갖고 있다. 나아가 한국은 한국이 가진 드라마 파급력을 세계의 환경문화 선도에 활용해야한다. 예를 들어 수많은 이들의 동경을 받는 한국 드라마의 주인공이 화려한 파티를 거부하고 에너지 절약에 힘쓰고, 자동차 대신 자전거를 타고 다니는 모습을 보인다면 아시아 전 지역에 굉장한 파급력을 지닐 것이다. 에너지 절약과 쓸모 있는 물건의 재활용 등 환경문제를 개선하기 위한 문화가 한국 드라마를 통해 유행하게 되면 주변의 많은 나라가 겪고 있는 환경 문제를 해결할 수 있다. 또한 많은 국가를 지속적인 발전의 길로 이끄는 효과도 기대할 수 있다. 점점 세계에 영향력이 커지는 한국, 이제 한국이 환경 문화를 선도하기 위해 출발해야 할 때다. I am consistantly struck by the incredible innovation displayed by Seoul Metro. Seoul Metro is second to none in creating new concepts for public transportation as a continuum with art, education and daily life. I am planning to interview CEO of Seoul Metro, Mr. Kim Ikgwan, when I get back to Seoul. 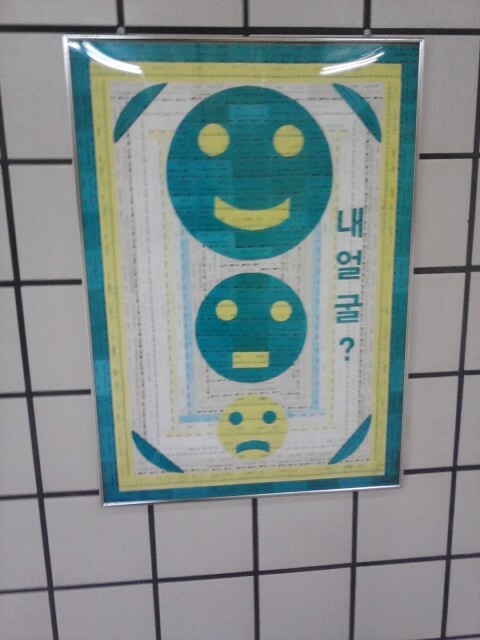 This work of art, titled “My Face?” seems to speaking for Seoul Metro itself. Made up of the metro tickets previously employed by Seoul Metro arranged in the shape of faces, I found it most mysterious. It goes beyond the usual “feel good” designs of public transportation to suggest an effort at true artistic expression. Many such works are springing up in Seoul Metro these days. The obvious solution to the environmental crisis is to devise a mechanism that will link the health of the global ecosystem directly to the economic rules that undergird all aspects of global finance, trade and investment in the post Cold-War era. That is to say, the environment must be embedded deeply into the heart of the global financial system and its roots must extend into the concepts by which we assess growth and imagine the economy. We would like to propose here that the most appropriate starting point for such a reform of our concept of the environment and its economic significance is with currency itself. The international community should establish an eco-currency that will serve either as a universal currency or as a factor that significantly impacts all the global currencies linked to the IMF . How much of that currency a nation possesses will be a reflection of its environmental policies. Such a mechanism stands the best chance of encouraging significant progress on the environmental front. If the eco-currency serves as one of several factors impacting all global currencies, it might serve as something akin to the SDR (special drawing rights) system currently employed by the International Monetary Fund. According to the IMF website, member [nations] with sufficiently strong external positions are designated by the Fund to buy SDR s with freely usable currencies up to certain amounts from members with weak external positions. That strong external position could be redefined so as to consist primarily, or entirely, of environmental criterion. The eco currency could also serve as a gold standard for all nations of the world, permitting each nation to increase its money supply in direct proportion to the environmental credits that it has accumulated through wise and effective policies by reducing emissions and preserving water and soil. After all, in that the gold standard was based on a mineral that was exceptionally rare and valuable, it is a logical extension of that concept to argue that a healthy ecosystem is the most valuable commodity available. In fact, the ecosystem is far more valuable than gold because it is so critical to human life. Each nation would continue to have sovereignty with regards to its own currency, but the calculation of that currency will take into account the environmental status of each country and its share of a calculated total of environmental credits for the entire world. Whether it served as a universal currency, or as a factor impacting all hard currencies, the eco-currency available to the world would be calculated as equal to a total global sum of environmental credits. Those credits would be assigned to a country based on an evaluation of how good a job that nation does reducing harmful emissions, preserving undeveloped lands, caring for its water supplies and otherwise implementing policies that have a positive effect on the environment. Although the calculation of what the total number of environmental credits for the world should be and the division of that total number between the nations of the world would be difficult, and at times political, it would by no means be an impossible task. Such an international currency program based on environmental credits would make the abstractions of carbon trading far more palpable and more visible in the financial world. The policy would require all makers of fiscal and developmental policy at the local level to engage in a serious debate on the implications of their policies for climate change as part of their economic policies. No longer would it be possible to think separately about monetary policy and environmental policy; the two would be effectively yoked together. By reflecting the consequences of good environmental policy at the core of our future economic system, we can ensure that environmental issues cannot be put on the back burner. 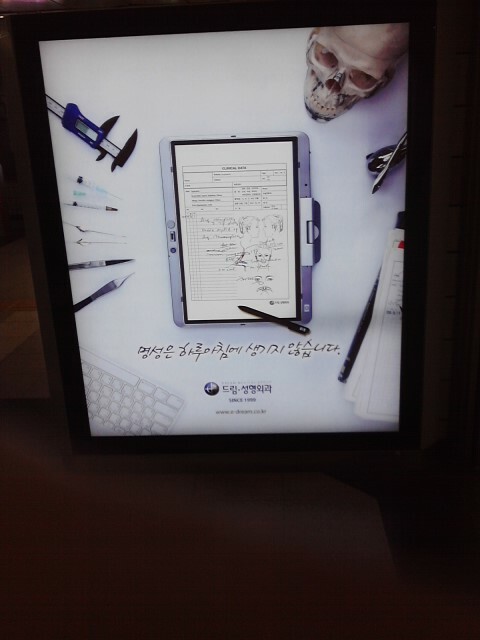 Well now Incheon Airport is offering the very latest: automated immigration. That is right, when you pass to your international gate from the terminal, it will now be possible to show your passport to a machine that will confirm who you are and stamp your passport. I have not had the chance to try, but I will as soon as I can. One wonders whether passports and visa stamps are on their way to the ash bin of history. After all, if we use Dr. Lee’s E-Positioning, we can make sure we know exactly where we are at any time. The key would be the effective integration of such systems with cyber-space representations. Of course there are some implications of concern, but that for a later post. Korea is a word leader in plastic surgery and only increasing its lead these days. There seems to be some unusual tie between technological change and plastic surgery, as if computer animation, movies, interactive social networks and plastic surgery were part of a continuum. Maybe the interest in avatars is spilling over into the alteration of one’s physical appearance. Or perhaps the full capacity of new innovations in IT and software is being most quickly applied to plastic surgery here in Korea. I stopped by a plastic surgeon myself the other day just to learn what could be done. I know I am getting a bit over the hill and could use some sprucing up. Well the range of options was mind-blowing and the enthusiasm, expressed was quite impressive. 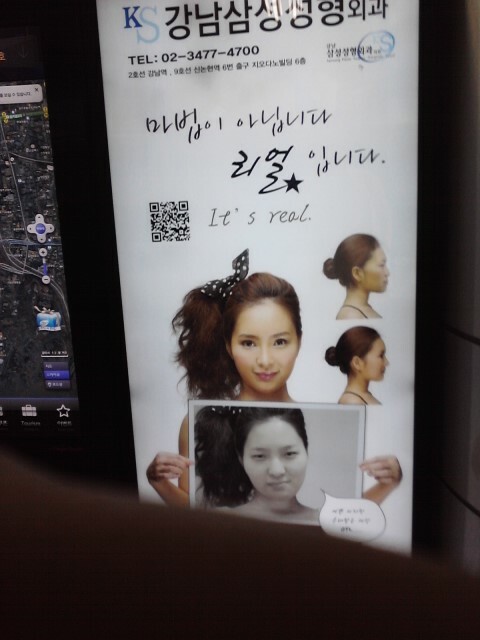 These signs around Seoul indicate the latest in plastic surgery. Very intriguing. The American is wearing a J. Press tweed jacket he bought in New Haven as he sits at the table surrounded Korea government officials and researchers discussing the future of biotechnology and its implications for his adopted home of Daejeon. As you draw closer, you notice the entire conversation is conducted in Korean.The American speaks has great familiarity with the language and an intensity of purpose. This unassuming, rather lanky, bespectacled man has close cropped hair that reminds one of a Buddhist monk. It is a remarkable coincidence that his classmate at Yale Paul Muenzen actually became the Venerable Hyon Gak Sunim and practices Buddhism in Korea. His name is Emanuel Pastreich, an American academic who hails from the Mid West. Pastreich has a Ph.D. in Japanese literature from Harvard University and taught Japanese and Korean studies at University of Illinois before turning his attention to Korea’s impressive drive to become global. In Daejeon he delivers talks frequently in fluent Korean, one day for the Electronics and Telecommunication Research Institute, and the next for the Daejeon Cultural Association. He writes for major Korean newspapers and has become something of a fixture in the Daedeok research cluster on the north side of Daejeon. “What fascinates me is how one makes a comprehensive strategy expand people’s perspectives. Everything, from how you greet people to what you eat and what you write, should be part of that effort to inspire those around you to strive for something better,” explains Emanuel Pastreich as he relaxes in front of his desk, surrounded by his beloved Chinese and Korean classics. Most internationals come to Daejeon to teach English or to do some very specific task for one of the technical research institutes here. Pastreich has taken up the role of advocate for a research cluster dedicated to addressing environmental issues and for a city that embraces the arts. He is well known in the town, from city hall to the mom-and-pop restaurants he has introduced on his website, as a man of many interests. Pastreich has taken an unusual approach to his engagement in Korea. He has tried not only to help the local government, but also research institutes, cultural organizations, even artists and writers. Pastreich produced reports on international cooperation in biotechnology, nuclear power, and environmental technologies. He helped launch the SolBridge International School of Business at Woosong University, the first university program in Korea with an all-foreign faculty. At the same time he has worked with smaller Korean firms on their internationalization strategies, successfully introduced foreign investment firms to promising local businesses, and worked to introduce the artists of the Daeheung-dong district to the world. And as a hobby, he has designed t-shirts and buttons which bear a new logo for the city of Daejeon. “It seemed like a t shirt was what we needed to create an international environment,” he explains. Sitting down with Dr. Pastreich is an experience in itself. He starts off by saying, “A group of researchers in the research cluster are working with me on a plan to turn Daejeon into an eco city” and the conversation is off to a strong start. Twenty minutes later a call comes in, and Pastreich speaks in Korean to the mayor of Incheon. The conversation reminds him of a recent conversation with the President of the Korea Research Institute of Standards and Science (metrology) about international collaboration. He is both looking at Korea from the outside, how an American might perceive Korea as an excellent place for international companies and research institutes to establish ties, and also from the inside in terms of what Korean institutions are looking for and how they can achieve their goals. The problem for Pastreich seems to be that he cannot find enough time in the day to follow up on all of his ideas. He is sketching a flag one day for one of the 40 ancient castles that surround the town of Daejeon. “If we want to make Daejeon a center for technology, we must first make it a cultural center. There are more castles in Daejeon than in any other city in Korea. Let us make up coats of arms for all of them and fly colorful flags over the ruins. That will attract people.” Certainly that assignment is nowhere in his job description, and some would say it is a distraction, but Pastreich seems to think the cultural aspect of the research cluster is just as important as the specific technologies. There is a very good reason why Pastreich has so many connections to the movers and shakers in the research, government and business sectors of Korea. Pastreich has been preparing for engagement with Asia practically his whole life. In a country where the most common type of foreign face is the twenty-something backpacker that stops by for a few months or a year to teach English, Pastreich’s undergraduate degree in Chinese from Yale University is a bit unexpected, as is having an M.A .in Comparative Literature and Culture from the University of Tokyo and PhD in East Asian Languages and Civilizations from Harvard University. Unlike most Americans, he conducted all his graduate work at University of Tokyo in Japanese, writing a 200-page dissertation in that language on the subject of the classical novel. These days he operates primarily in Korean, but is entirely capable of expressing himself in Japanese and Chinese when the need arises. Pastreich has consistently felt that Korea has to be understood on its own terms. He reads Korean newspapers and writes articles on policy issues in Korean for major journals. He has appeared repeatedly on KBS TV speaking eloquently in Korean about critical issues. He was in the middle of Korean policy even while teaching in Washington D.C. Before and after his classes at George Washington University, Pastreich was worked to promote closer ties between Korea and the United States. Pastreich had a little office on the fourth floor of the Korean Embassy Culture Center with wood floors, an elegant desk and a view of Rock Creek. He served as editor-in-chief of Dynamic Korea, the Korean foreign ministry’s online newspaper, writing articles about Korea and East Asia. It was extremely unusual for an embassy to give an American such responsibility, but Pastreich was allowed to write on a variety of topics and conduct professional interviews with Washington’s top policy makers. His interviews with Steve Clemons, Donald Gregg, and Joseph Cirincione were widely read. Pastreich advised the Korean Embassy directly on certain matters from time to time, but he was working primarily to advance Asia as a subject for serious discussion in Washington DC. He was in constant dialog with friends at the Asia Society, the American Chamber of Commerce, and the State Department about Korea and about Asia as a whole. The Korean Embassy wanted Washington to take Korea more seriously and Pastreich served that role. At the same time, Pastreich formed the core of a group of people who wanted Washington to take Asia more seriously. “I would speak honestly with congressional staff members, congressmen and businessmen, stressing that we were going to need people in the future who can read and write Chinese in America. I spoke very bluntly about how the US is ignorant of Asia,” Pastreich explained. He found many sympathetic ears of all political stripes. Pastreich stressed repeatedly his concern that the United States is increasingly tied to Asia in terms of finance and technology, but most Americans do not have the vaguest sense of how that part of the world works. While in DC, Pastreich was visited by a colleague from the Korean government who had recently been appointed vice-governor of Chungnam Province in South Korea. The official asked Pastreich to serve as advisor to the governor, a rising figure in Korea, on Foreign Direct Investment, international exchanges, and education. Pastreich was drawn to this offer because he wanted to understand Korean politics at the grass-roots level. “My sense was that local governments are increasingly handling their own foreign relations and I wanted to be involved. Most Americans stay in Seoul. I wanted to see the rest of Korea,” he explained. The relationship blossomed and Pastreich became a fixture in Daejeon and Chungnam.Pastreich accompanied the governor on trips to the United States and Japan, wrote a series of proposals for the economic development of Chungnam, and worked individually with every single section of the provincial office to understand their needs and their perspectives. Most of the civil servants had never spoken with a foreigner before. And there Pastreich was, with his shy smile, listening to their concerns and making suggestions as to how to deal with the outside world. He was there in the provincial office’s cafeteria; he traveled out to Taean when there was a terrible oil spill in 2008 to help out with international coordination. He wrote an article about the oil spill in English that helped to explain the experiences of ordinary citizens for an international audience. He visited schools, promoted local ginseng, and helped translate menus at restaurants and hotels across Chungnam Province. Pastreich’s second job was as professor at Woosong University, a position that afforded the flexibility that he needed to concentrate on the province. Over time, however, Woosong University became more central. “When Woosong decided to start a true international business school, I threw myself into the thick of it. What an opportunity! I can honestly say I helped to found a school here in Korea,” Pastreich explained. He was the first foreign faculty member of the university, and served as the dean of the SolBridge International School of Business. He used his connections to build up a strong faculty roster and did his best to make the international business school stand out as something to be proud of. Soon after Pastreich participated in the launch of the SolBridge School, one of the Korean professors, aware of his success with KORUS in Washington, DC, suggested that Pastreich devote his efforts to establishing a think tank. Pastreich was not prepared for this request. But after consulting with his contacts and considering possible approaches, he decided that a think tank focused on technology would best contribute to the interests of Daejeon. “Korea is the center for innovation in technology,” he explained. “Since Daejeon is the site of Daedeok Innopolis, Korea’s version of Silicon Valley, it made sense for the research institute to focus on technology and its impact on society. Pastreich founded the Asia Institute dedicated to this ideal. He was soon working on projects with Koreans, Americans, Japanese and Indians. Nevertheless, Pastreich did find those who were open to the American approach. The topic with the greatest amount of traction with researchers was the environment. Daejeon is a basin trisected by three rivers and surrounded by tree-covered mountains. It would make a perfect Eco-city. Although Daejeon has many researchers working on topics related to the environment, there was no general forum for communication between the researchers at different institutions and no exchange with the city of Daejeon concerning environmental policy. Pastreich co-authored an article with Junghoon Han, a researcher at the Nuclear Fusion Research Institute, calling on Daejeon to transform itself into an Eco-city by bringing the environmental technology of the research institutes to the city (see “Daejeon’s Green Growth Forum” ). The response to the article was overwhelmingly positive. Pastreich received calls from experts across the research cluster and in February 2010, the Daejeon Environment Forum- made up of experts from the major research institutes- was formally launched. Vice President Yang Jiweon of KAIST (Korea Advanced Institute of Science and Technology) served as chairman of the forum and fought hard to get the attention of decision makers. The Forum was recognized by the Ministry of Knowledge Economy, gaining national attention. Subsequently, Pastreich traveled with his Korean colleagues to Washington DC, Stanford University, and Tsukuba in Japan to discuss international collaboration between Eco-cities. The Eco-city concept came to embody Pastreich’s vision of the “marriage of technology and society.” He advocated the concrete application of technology produced in the cluster to the environmental needs and problems of the city itself. Soon after, the Korea Institute of Energy Research (KIER) started a program to make their solar panels available to the local community. Pastreich wanted the effort to be global. He would later write a proposal with John Feffer to rebuild the city of Wenchuan as an Eco-city after it was damaged by an earthquake (see“Wenchuan as an Eco City”). The proposal was translated into Chinese and published by China News, leading to several initiatives in the Wenchuan area for more green construction. Interestingly, of all the international conferences that Pastreich has helped organize, Pastreich takes the greatest pride in a small seminar of students that he convened in the summer of 2008. With the assistance of Tsukuba University and the United Nations Environment Programme, Pastreich invited ten students from China, Japan and Korea to talk about “3E.” 3E, a termed coined by Dr. Inoue Hisao of Tsukuba University, refers to the complex interaction of the environment, energy and the economy. Tsukuba University started the 3E Forum to discuss technical aspects of this topic among senior researchers in 2007. Later, Tsukuba also started a 3E Café for young people in Tsukuba. Parallel to this conference, Pastreich arranged a series of intensive seminars and visits to research institutes intended to start a dialog among the students working on 3E from the three central nations of the Asian economy: China, Japan and Korea. They spent many hours together learning about technologies from experts in the cluster and debating with each other about how a transformation of Asia’s economy should be achieved. Students from Nepal, Pakistan, India, Russia and Mongolia also joined in the discussion. It was a frank debate that did not shy away from arguments about responsibility. The high point of the 3E Forum was a lecture by the founder of Ecocity Builders, Richard Register, who spoke about the future of the city in an age of ecological challenges (see “The 3E Forum in Daejeon” ). Register is the man who coined the term Eco-city back in the 1970s and helped build the environmental movement. He spoke with a tremendous enthusiasm that cascaded through the group of students. The Asia Institute has developed along two axes: technologies and their implication for society and the technological and economic development of Asia as a totality. At a deeper level, the Asia Institute is dedicated to pulling Asia together as a whole-and Pastreich imagines the United States to be geopolitically fated to align itself with Asia. Pastreich imagines, according to the website, a truly pan-Asian research institute that investigates technology’s impact on societies and the environment from the Middle East to Southeast Asia, from Russia to Japan. Pastreich identified the Middle East and India as two parts of Asia where partnerships with South Korea might be established. He started with the Middle East. Pastreich anticipated that ties between Korea and the Middle East would increase rapidly. Most Korean companies had reduced their presence in the Middle East when the Asia Institute was launched in 2008. Pastreich undertook to start an open dialogue between Korea and the Middle East on important topics involving the environment and technology. At the time there was almost no cooperation taking place between institutions or individuals in the two parts of the world. Pastreich sensed that there was a significant need for deeper dialogue and consequently started the East Asia Middle East Program, with the intention of eventually including China and Japan. Fahad Altouraif, the Vice President of NCB Capital, a Saudi Investment Bank, was the earliest recruit to the collaboration. He agreed to serve as director of the East Asia Middle East Program. He and Pastreich made several proposals for cooperation with Korea that were widely discussed in the Middle East. Next, Mezyad Alterkawi, CEO of the Riyadh Technology Incubation Center at King Saud University, took over as director and started a very close collaboration that included a series of articles published in Yonhap News and other major Korean newspapers calling for closer collaboration between Korea and Saudi Arabia. Alterkawi brought Saudi Investors to Korea, arranged for high level visits of Koreans to Saudi Arabia and argued strongly for the importance of bilateral relations with both Saudi and Korean leaders. Pastreich had speculated that India too would reward efforts for greater intellectual dialog with Korea. He started several research projects related to the Comprehensive Economic Partnership Agreement between the two nations that was signed on August 7, 2009. Although there was much discussion of the potential for deeper cooperation, few institutions in Korea and India were engaged in actual institution-building. The Korea India Business and Technology Initiative of the Asia Institute hired Ms. Neeru Biswas, an IIT graduate, as its director. She helped to negotiate a Memorandum of Understanding (MOU) for close cooperation in research between the Indian Nano Consortium and Korea’s National Nano Fab Center. This MOU required intense discussions on both the Korean and Indian sides and a powerful vision on the part of the Asia Institute to inspire both parties to cooperate. It was the first such MOU between Korea and India in the field of nanotechnology. What is clear from the conversation with Pastreich is that his interest in technology and the environment is part of a dialog is bigger than Daejeon, and bigger than Korea. Pastreich is appreciated by Koreans for his enthusiasm regarding Korea’s potential, and his willingness to work tirelessly for goals in which other foreigners take little interest. At the same time, Pastreich idealism about Korea’s global role is not always aligned with the assumptions held by Koreans. Although he listens carefully to what the Koreans need, and works closely with them, there are subtle aspects of his work that can be traced back to his arguments over the last ten years for US engagement with Asia as a whole. Pastreich’s work on environmental policy in Daejeon is linked to his arguments for international international cooperation. His ideas are vertically integrated like a set of nested chairs. Such a three-dimensional approach to problem solving is confusing to many around Pastreich, and his critics remark that he seems to be running in every direction instead of focusing on one project. From the perspective of many Koreans, who adhere to the cultural norms of clearly defined jobs and expertise, Pastreich is simply spread too thin. “Professors of classical literature are trained to teach literature,” remarks one Korean. Whether it is making a website for Daejeon, organizing conferences, or writing proposals for teaching children about climate change, everything is part of the plan for Pastreich. But for some Koreans, the whirlwind is more confusing than enlightening. But there are also those who are big fans of Pastreich’s “broad canvas” approach to Korea. They welcome this outsider who tries to form bridges where none have existed before. The complex response of Koreans to Pastreich can be traced back to the contradictions in Korea’s intellectual history. There is a strong tendency in Korea to succeed by intensely concentrating on a single field. Korea became a major player by throwing all its resources into shipbuilding and memory chips. Specialization was valued and humanities were considered marginal in Korea’s model for economic success for the last sixty years. But beneath the surface of today’s extreme specialization is a long tradition in Korea of respect for a engagement in all fields of science and the humanities. After all, the most honored Korean King Sejong dabbled in everything from literature and linguistics to agriculture, mechanics and astronomy. If Pastreich had come to Korea 100 years ago, is would have been obvious why someone with a background in the Chinese classics should be involved in science policy. That Korean tradition of a marriage of the humanities and sciences is making a come back. When E. O. Wilson’s book “Consilience, the Unity of Knowledge” was translated into Korean a few years ago, it became a run-away best seller. The hottest word among policy makers in Seoul is “convergence” these days. Korea’s national assembly passed a law to make technology convergence a national priority in November of 2010. The mandate for Koreans is to find connections between previously unrelated fields allowing discrete technologies to spill over on to each other. Nanotechnology merges with biotechnology, IT with tourism, medical technology with social networking. A growing number of Koreans recognize the potential benefits of breaching these disciplinary walls, and linkage with the liberal arts is considered essential. It is no surprise that Pastreich has recently embraced convergence, writing articles advocating convergence between biotechnology and construction, social networking in IT. He was appointed as a founding member of the Korea Industry Convergence Association- an unprecedented distinction for a foreigner. Perhaps the paradox of Pastreich work in Korea is wrapped up in the complexities of Korea today: a strict Confucian society in which everything must be done by the rules, and yet at the same time one of the most innovative societies, full of first adopters. Koreans are strict about which box people should be in, but they are also quite open to combining technologies. There is certain logic about a literature professor turned philosopher of technology finding a niche for himself in the Hermit Kingdom. When Pastreich brings local artists along with him to a talk at the Electronics Telecommunications Research Institute, it strikes some as bizarre. But maybe, just maybe, he learned something about Korea from his readings of the classics.